In the heart of the Syöte National Park lies the Iso-Syöte Hotel. Sitting proudly atop one of the highest fjells in the region, it enjoys a commanding view across the snowclad forests, which during the day the pink, purple and blue hues of an Arctic sky reflect on the elaborate snow sculptures that form much of the surrounding landscape. During the night the area is often blessed with a dazzling display of the Northern Lights. 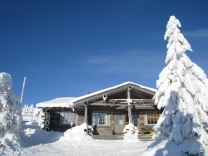 Spend Christmas in a traditional Finnish Kelo cottage, whilst enjoying all manner of ski, safari and spa activities. Fly to Oulu (via Helsinki) and transfer to the Iso-Syöte Hotel, where on check-in you will be shown to your chosen accommodation. Dinner will be served in the panoramic restaurant and after an aperitif, head home making sure you keep any eye out for the northern lights overhead. A plentiful buffet breakfast is served in the restaurant at the hotel, after which you will meet in reception for your first Arctic adventure. First collect your outer thermal clothing (yours for the duration of your stay) before heading by car to a nearby frozen lake. Your guide will show you how to drill a hole in the ice before lowering your line in the hope of catching some Arctic Char. Coffee and stories are served up by an open fire. This is a relaxing opportunity to acclimatise yourself to your surroundings. Return to the hotel, where you can have lunch (pay locally), enjoy the hotel facilities or relax in your cottage, before dinner is served in the hotel restaurant. Enjoy a leisurely breakfast in the hotel restaurant. The remainder of your day is at your leisure. You may wish to book a day on the nearby ski slopes or simply make use of the hotel’s pool and outdoor hot tubs. We can supply you with the choice of spa treatments on offer (pre-booking is essential). In the evening a festive Finnish New Year buffet is served. Breakfast and morning at leisure, before presenting yourself at reception in time for an afternoon of snowmobiling. After full instruction and safety briefing by locally qualified guides, you will head off in the wilderness. Driving in pairs, with children following in a sledge behind the guide the track first takes you down from the fell, then across frozen mires and through the snowclad forest. A break is taken for a warming coffee by a campfire, before swopping driving duties and heading back up the fell to the hotel. The remainder of your day is at your leisure. Alternatively, more excursions are available – please discuss the options with your consultant. (Supplements and pre-booking essential). Dinner is served in the hotel’s main restaurant. Enjoy a leisurely breakfast in the hotel restaurant. The remainder of your day is at your leisure. You could choose to experience the ski-slopes again or try your hand at kick sledding or snowmobile out in search of the northern lights. Please discuss the options with your consultant (Supplements apply and pre-booking is essential). Dinner is served in the hotel’s main restaurant. After breakfast today you will transfer to a local husky farm, where the dogs are eager for their morning run. You will receive an introduction to the dogs and instructions on how to mush your own team. Then you will head off (driving in pairs) through the snowy forest and frozen lakes that that surround the farm. There are plenty of photo stops and opportunities to swop drivers. Lunch is served by a campfire, before you head back to the farm with your happy huskies. Dinner is served in the hotel’s main restaurant. 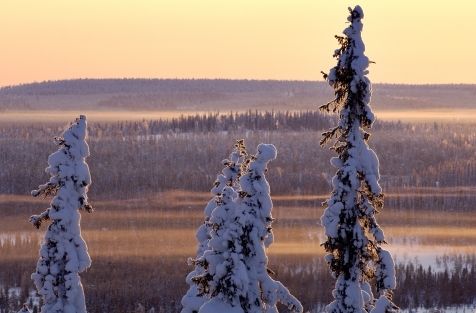 Today is free for you to determine how you would like to spend your penultimate day in Finnish Lapland. Optional additional excursions include a visit to a local reindeer farm, a snowshoe hiking trip or a further husky safari. Or simply enjoy your magical surroundings. (Supplements apply and pre-booking is essential). 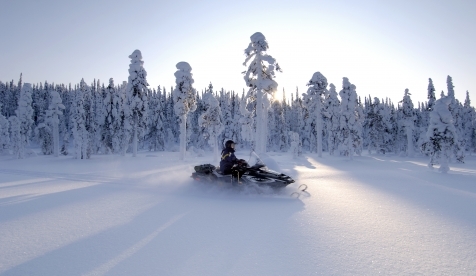 Enjoy breakfast and perhaps a last minute toboggan, before check-out and transfer back to Oulu in time for your return flight home (via Helsinki). We are able to offer additional excursions and spa treatments. Pre-booking is essential as excursions are subject to availability. Supplements apply. Please also discuss with your consultant should you wish to change any of the included excursions. 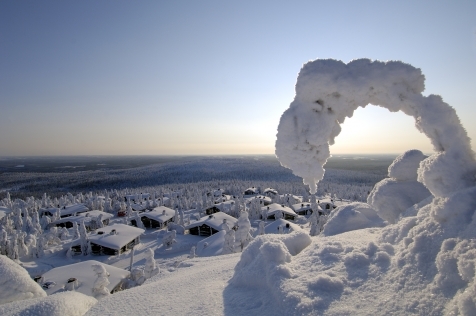 Sitting on top of Lapland’s southernmost fjell is the village of Iso-Syöte, which is cloaked throughout the winter in deep, white snow. At its heart is the Iso- Syöte Hotel, complete with panoramic restaurant, Arctic Spa and bar. Flexible accommodation is the order of the day. Choose from simple standard twin rooms or picturesque and cosy 1-bedroomed Kelo pine cottages. The hotel also boasts modern 2-storey fjell top cottages which can sleep up to 8. Finally consider spending a night in the snow igloo or upgrade to the magnificent Eagle View Suite, where the walls and roof are made of glass allowing uninterrupted views of the surrounding hills and a chance to view the Northern Lights in comfort and style. 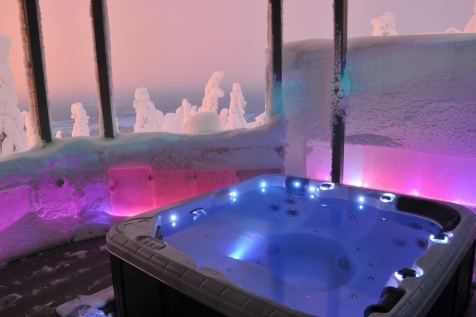 The hotel has created an ‘Arctic Spa’ complete with two spacious saunas, a swimming pool with massaging hydrojets and, for the ultimate experience, two outdoor Jacuzzi’s, which enjoy uninterrupted views of the snow-covered trees and starlit sky. There is a range of Arctic Spa Body & Beauty treatments also available. Running down the side of the hotel are no fewer than 12 illuminated ski slopes. There are also half and quarter pipes, a snowboard park, children’s slopes and sledding hill. In other words, facilities for just about every level of experience. Iso-Syöte Kelo cottages are located a little further down the fjell but still in the hotel grounds. Depending on your location it is a 10-20-minute walk to the main hotel. Toboggans are on hand for children! These cottages are made from huge pine tree logs and present a rustic, cosy and authentic feel. Simply decorated, each cottage has a living room/kitchenette, private shower/WC and sauna. Bedroom configurations depend on your individual cottage. After being transferred to the husky farm you are met by a team of dogs who are eagerly waiting for visitors. After an introduction to the dogs you begin your 12km husky safari through the snowy forest and frozen lakes surrounding the farm. Learn the art of kick-sledding, an easy and convenient Finnish mode of transport enjoyed by all ages. Your efforts will be rewarded with a warming coffee and ‘Pulla’ served in a kota with open campfire, before returning to the hotel. Try this relaxing mode of traditional transport, sitting in a sled that forms part of a reindeer ‘caravan’. Coffee and snack are served in a Lappish Kota. After personal instructions on how to use your snow shoes, set off through the deep snow covering the hilltop of Iso-Syöte. Along the hike enjoy the beautiful snow sculptures made by nature and discover marks and tracks of the arctic animals. Hot drinks and cookies are provided. 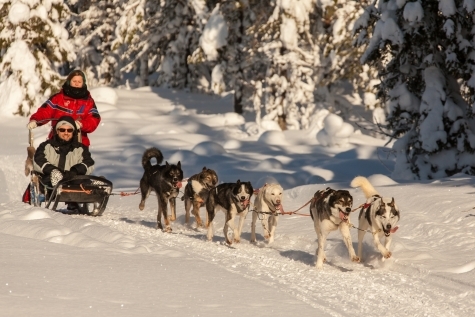 Travel by snowmobile to a nearby husky farm and mush a team of huskies. Travelling in pairs, you take turns to drive the snowmobile and mush your eager dogs. The safari takes you through snowy forests and ice-covered swamps and enables you to appreciate the wonderful landscape and light that bathes the Syöte area.